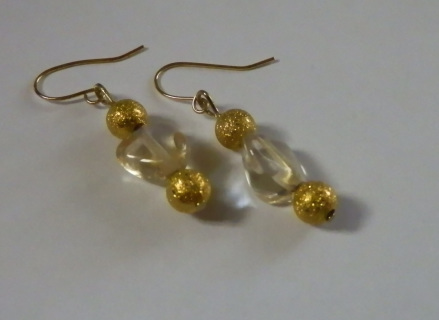 All Lexington Lights earrings and necklaces are crafted of crystal, glass, and/or semi-precious stones. Each one is unique and designed to last, and most complement our necklaces. Click on each image for a closer look . . . and check back soon for new items . 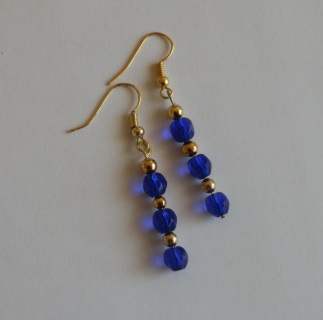 . .
Three pretty blue glass drop beads separated by tiny gold-filled beads adorn each earring; approximate length from top of french hook is 2." 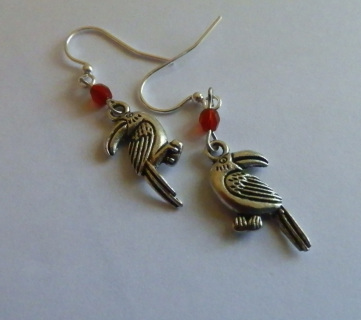 Tiny cute toucan earrings, very detailed on both sides, with an accent of a red bead. The toucan is approximately 1" long; approximate length from top of french hook is 1 7/8." Now you can let everyone know you're a toucan lover in style! These also make great gifts. 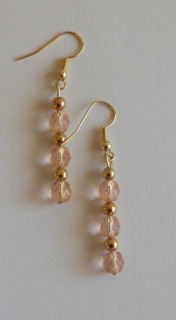 Three pretty pink glass drop beads separated by tiny gold-filled beads adorn each earring; approximate length from top of french hook is 2." 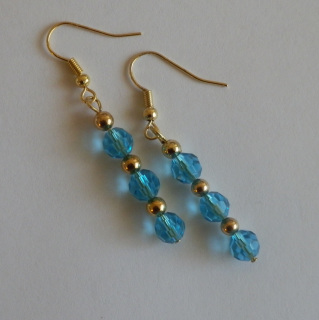 Three pretty aqua glass drop beads separated by tiny gold-filled beads adorn each earring; approximate length from top of french hook is 2." 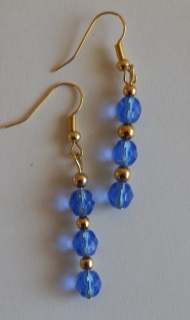 Three dark bue glass drop beads separated by tiny gold-filled beads adorn each earring; approximate length from top of french hook is 2." Check back soon for new items! 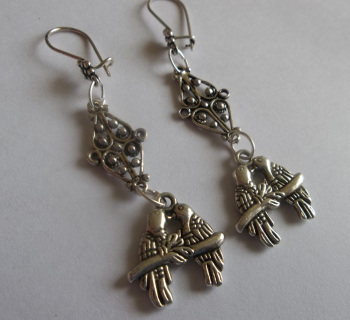 Kissing lovebirds earrings, detailed on both sides, in antiqued silver. 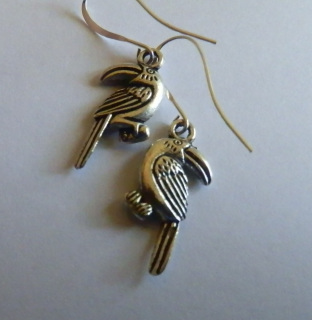 The parrots are about 5/8" long and the total length from the top of the french hook is about 2 1/2." Now you can let everyone know you're a bird lover in style! These also make great gifts -- remember, the holidays are fast approaching. 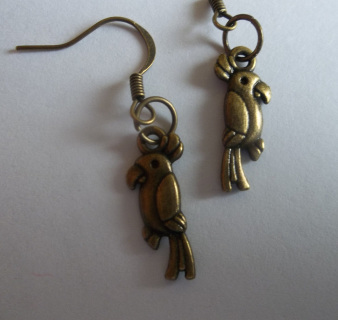 Teeny tiny little parrot earrings, detailed on both sides, in antiqued brass. The parrot is about 3/4" long, and the total length from the top of the french hook is about 1 1/2." 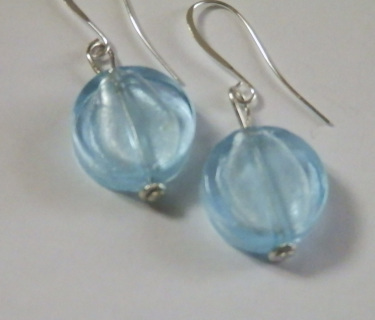 Oval icy blue earrings; oval bead is approximately 5/8;" approximate length from top of french hook is 1 5/8."